What does it mean to be international in the globalized world today trapped between a centripetal movement of reinforcement of national borders and an unprecedented flux of mobility and migration of people across them? It seems that a question of how to live together is calling to be updated and claiming its importance in a current moment in history living through a combination of “post-” and “neo-“. A set of three panel presentations and a following discussion will focus on the notion of internationalism today through different perspectives and in dialogue with a local context of Barcelona. Moscow-based curator and current resident at BAR project Elena Yaichnikova will present a view on a political and artistic context of Russia reflecting on its enclosures and openings, inclusions and exclusions through some video works of Russian artists; Barcelona-based and Peruvian-born artist Daniela Ortiz will introduce her artistic projects that question the Spanish colonial past and it´s relation to the current migratory control system; Catalan curator Carles Guerra will focus his talk to reflect about Barcelona as a complex and problematic space determined by a dialectic between the old nation-state and the new territoriality which determines the urban condition, understanding the most urgent issue in identify which is the productive tension that makes cultural production relevant. Christian Nyampeta, Prototypes for New Habits, 2014. 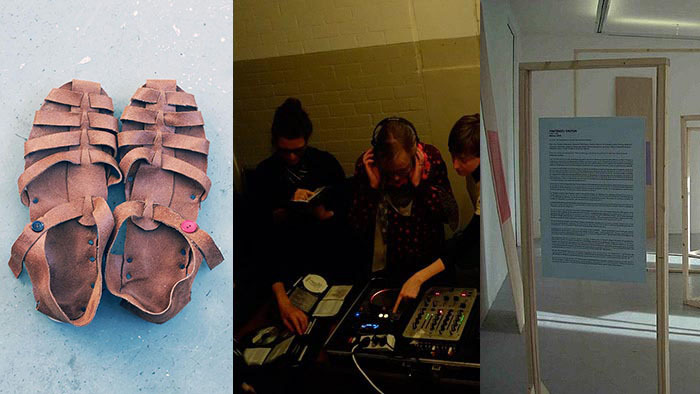 BAR project’s 2015 residency program is inviting artists and curators whose work research and essay different ways of living together in the world and alternative forms of community. In this context, artists Christian Nyampeta (UK), and Maria Guggenbichler (D), and curator Elena Yaichnikova (RS), in residence until the end of May, will be presenting their work and introducing the projects they are developing in Barcelona. Christian Nyampeta is an artist who investigates into how individuals and communities negotiate forms of socially organised violence. Nyampeta makes use of what he, following his friends, refers to in terms of practical philosophy. This is a “poeisis of worlding”, making and doing that generates both singularised and collective considerations, in the hope that such understanding may relieve some of the anguish to which the legion of structural oppression subjects us. Owing to the generosity of many and their collaborative efforts spanning over a number of years, Nyampeta has staged social encounters through which various artists, philosophers, practitioners, institutions and individuals live and work together, and through which workshops, seminars, interiors, instruments, exhibitions, fellowships and publications have been materialised. These activities take place regionally and further afield, in public institutions as well as in intimate circles of regional homes, in transnational research groups and other bodies that do not easily lend themselves to wording. Nyampeta’s theoretical anchor is the study of the ways of work and life of the early ascetics and monks and their organisational principles. Nyampeta is a PhD candidate at the Visual Cultures Department of Goldsmiths, University of London. Here, he researches idiorrhythmy, a formational concept for regional utopian imaginaries drawn from early monasticism, proposed through the seminar lectures of Roland Barthes at the Collège de France titled How To Live Together. Ongoing activities include contributions to research programmes of How We Behave, The Grand Domestic Revolution, Practice International and Tagore’s Universal Allegories. Recent exhibitions include How to Live Together: Prototypes, The Showroom, London; New Habits, the research group exhibition organised by Casco – Office for Art Design and Theory, Utrecht; How To Live Together at Casco and at Stroom Den Haag between 2013 and 2014. Maria Guggenbichler is a conceptual artist and curator who uses social exchanges such as conversations, collaborations and jokes to find new functions for art in society. Her work is realised in ongoing and long-term dialogues and friendships. Outside institutional walls, her projects create accessible, joyful and reciprocal spaces, in self-organized, informal and often domestic structures. Since 2005, Maria has collaborated with the artist Rosalie Schweiker. Together they organised a holiday for female artists (Funny Women Art, 2013); published a reader about the “fact that art institutions gladly incorporate feminism as long as it is authored by men” (Clever Men’s Art, 2014), and had a solo show under the name of a male artist (Outpost, Norwich, 2014). Together with the curator Amal Alhaag, Maria founded the Side Room in Amsterdam. The Side Room is a platform for diverse actors’ intersectional feminist, queer and anti-colonial gathering, listening, learning, experimentation, dancing, DJ-ing, (re-)mixing, musings, and doings. Maria is co-editor of queer-lesbian arts magazine Girls Like Us since 2014.